The Vancouver Canucks are staring elimination from the Stanley Cup Playoffs square in the face tonight in Los Angeles. Being down three games to none is most likely going to spell the end for Vancouver’s Cup dreams. Even with a victory tonight the prospects of overcoming such a deficit seem unlikely. With that, we are also on the brink of a whole lot of questions to be asked about the team and its future. Do the Canucks need a new leader? These questions will have to be addressed during the off-season, which sadly will be starting next week. 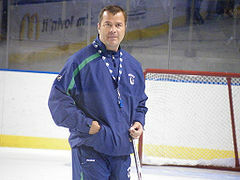 For starters, what is to become of Alain Vigneault? He is easily the most successful coach in the history of the franchise, has been nominated for the Jack Adams three times, won two President’s Trophies and got the team to within one win of the Stanley Cup. Seems like his future should be safe. However, the chirps about his job are already starting. Some have outright called for his firing, while other’s like The Province’s Wyatt Arndt take an interesting look at NHL coaches longevity and success. While Arndt is not calling for Vigneault to be fired he poses an interesting question about how long coaches can be successful in the NHL. Mike Gillis will have to take a long hard look at his coach and whether or not he feels he can still guide this team to glory. The second huge question looming surrounds the goaltender situation. Roberto Luongo, despite what his horde of critics will try to convince you of, has been an elite goaltender for the Canucks but with Cory Schneider getting the start in Game 3 you have to ask about who they want to start next October. This is not a knock on Luongo but it seems only logical that Gillis will have to explore the possibility of moving him. Obviously Luongo would have to be willing to waive his no trade clause and the Canucks would have to find a suitor willing to take on his $5 million cap hit. Cory Schneider is younger and maybe ultimately slightly better than Luongo and not exploring a way to keep him long term would seem almost negligent. Gillis has to test the waters with moving Luongo. Otherwise he, and Canucks fans, will watch Schneider win Vezinas for teams like Tamp Bay or Columbus for the next decade and wonder about what could have been. In the end he may have to part ways with the young American and if he does, Canucks fans will feel better knowing that he tried to explore every avenue first. Their past two playoff losses have exposed a lack of consistent offense for the Canucks. They were not able to generate anything against Boston and are coming off a 1-0 shut out loss to Los Angeles. The Canucks power play has been woeful for the past month and they will need to find more offense next season. Alain Vigneault seemingly tried every conceivable line combinations this season and nothing worked on a game to game basis. The second line was a revolving door and they still have not found anyone who is compatible with Ryan Kesler. This will need to be addressed otherwise the Sedins will get a heavy dose of pounding again next year and the Canucks will have no answers. Where that scoring will come from is uncertain. It most likely will have to come in the goaltender trade as the Canucks will not have a ton of cap space to play with. They will have to move one goaltender and if they are able to bring back a scorer they will have addressed a glaring weakness that has plagued them the past two seasons. You also have to wonder which of their younger prospects are ready to make the leap to the NHL next year. Chicago Wolves goaltender Eddie Lack seems like he is ready to step up and take the number two goalie slot. You also have 19-year-old Nicklas Jensen who was a point per game player in the OHL this season and recently netted a hat trick in his AHL debut. Can he crack the lineup and provide some scoring punch? With the Canucks season probably ending this week the team will need to lick their wounds and start to dive into these and other questions in order to wipe the disappointment from their mouths. They will need to put this horrible finish behind them and prepare for next season. They still have a great core of players that, with the right answers to these questions, can be right back in the thick of things next season.